The Dadaists, a cultural movement that began in Europe towards the end of World War I (1916) invented a number of art-construction techniques, including collage and photo montage. Many of their works were collaborative, including exquisite corpse, a method by which a collection of words or images was collectively assembled. Each collaborator adds to a composition in turn, either by following a rule or by being allowed to see the end of what the previous person contributed. A shared instance of Write can be used in a similar way to create a collaborative story, poem, rhyme, or group stream of consciousness. It is fun and easy to use Write for group storytelling. Simply share a document with a group of friends (or your class); take turns opening the document and adding to the story. Open a document in Write. One at a time, each person in the group should open the shared document by clicking it in the Neighborhood View. During their turn, they should follow the rule to add to the end of the story. After each person has added to the story, the person who started the story should read it aloud to the group. Add a sentence that continues the theme of a story. Add a new sentence that starts with the last word of the sentence that comes before it. Add a new word that begins with the same letter as the last letter of the word before it. Add an adjective after a noun, a noun after an adjective. 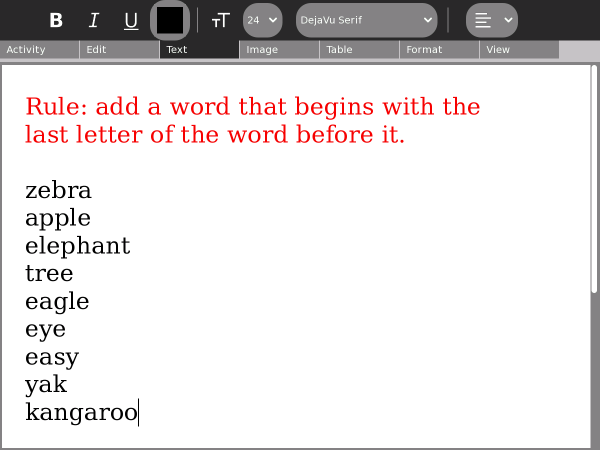 Add words in alphabetical order. You can use Write to play a variant of the Telephone Game (See http://en.wikipedia.org/wiki/Chinese_whispers). Rather than passing a sentence around the room by whispering a phrase, each successive participant in turn repeats a short story though words and pictures. The cumulative errors that result from the interpretation of illustrating a story and subsequently captioning a picture is both amusing and an opportunity to discuss narrative techniques. Alternate between writers and illustrators. A. Create a new document in Write. B. Write a short story—two or three sentences. C. Share the story with the next student. A. Open the shared document and read the story. B. Create a new document in Paint. C. Create a picture to illustrate the story. D. Share the picture with the next student. 3. Continue until every student has either written a story or made a drawing. 4. Share the results with the class in the order in which the stories were created. 5. Discuss where and why the story changed as it moved through the class and across media.